Troopers looks at a futuristic Earth that operates under a fascist system. The film primarily follows a crop of kids who graduate from high school early in the film. Our three protagonists enter the military. Carl (Neil Patrick Harris) possesses psychic abilities and strong technical savvy, and he gets a top secret assignment in intelligence. Carmen (Denise Richards) wants to be a pilot, and she enters the academy for that training. Johnny (Casper Van Dien) signs up mainly to make himself more appealing to Carmen. They’re a couple, but it’s clear that she has a wandering eye and Johnny doesn’t stand a chance if he doesn’t become a “citizen”. Military services offers the quickest route to that status, so Johnny enters the mobile infantry. The film focuses mostly on Johnny’s progression. Occasionally it flips over to Carmen’s training, and we see her relationship with Johnny’s competitor on the high school football field and for Carmen’s heart, Zander (Patrick Muldoon). We only encounter Carl when he meets up with the other two; otherwise the movie displays virtually none of his work. Johnny makes squad leader in camp but loses this status after a tragic training mishap. Even though he accepts physical punishment for his role, he decides to walk down “Washout Lane” and go back to his wealthy family in Buenos Aires. However, this option vanishes in the blink of an eye. The Earth society battles against a bug planet called Klendathu, and those critters attacked South America with an asteroid bomb. This vaporizes Buenos Aires and gives Johnny the will to return to the military. Soon he and his fellow cadets enter the war, and the second half of Troopers mainly revolves around those battles. Very little action occurs in the film’s first hour or so, but the movie makes up for this. A few interludes occur, but most of the second hour shows the vicious fights between humans and bugs. 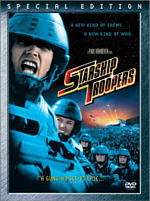 Starship Troopers appears in an aspect ratio of approximately 1.85:1 on this single-sided, dual-layered DVD; the image has been enhanced for 16X9 televisions. Much of the picture looked fantastic, but some niggling concerns kept it from becoming reference level. Sharpness looked immaculate. The image consistently appeared crisp and detailed. I saw virtually no examples of softness or fuzziness during this distinct and accurate presentation. Jagged edges and moiré effects also raised no issues, while I discerned no signs of edge enhancement. Colors appeared excellent. Actually, a few scenes during Troopers displayed some of the strongest tones I’ve ever witnessed. The football game and the dance sequence early in the film offered simply astonishing hues that were intense and flawless. The rest of the movie didn’t seem quite as amazing, but it always presented clear and distinct colors. Black levels also came across as deep and dense, while shadow detail was clear and appropriately opaque. The only area in which Troopers lost points related to print flaws. While these never appeared heavy, they did seem too prevalent for such a recent movie. Light grain cropped up at times, and I also noticed occasional examples of specks, grit, nicks, and spots. Without these issues, the DVD would have earned a solid “A”, but the defects forced me to drop my grade to a still-strong “B+”. Owners of the original DVD will want to know how its picture and sound quality compares with this new one. To my eyes and ears, they looked virtually identical. I switched between them to examine different scenes and I didn’t detect any substantial differences. Since the old one looked and sounded quite good, I don’t regard this as a negative, though clearly the image could have been improved slightly. This new two-disc release of Starship Troopers supplements the original single-platter 1998 edition. We find virtually all of that package’s supplements as well as some new ones. To make it easier to distinguish new extras from old, I’ll underline all the new one’s exclusive pieces. 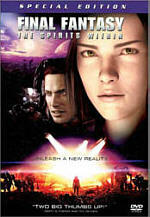 The special edition set provides two audio commentaries. The first comes from director Paul Verhoeven and writer Ed Neumeier, both of whom were recorded together for this running, screen-specific affair. It works better than most commentaries because Verhoeven and Neumeier so strongly discuss what they tried to do. Since they feel so many people misunderstood the movie, they take great pains to articulate their true intentions. Verhoeven spends too much of the track pointing out what visual effects were "real" and what were computer - which also contributed to my opinion that he's a very mechanical director - but even with that fault, the commentary is an excellent look at the film. Next we find a second commentary. 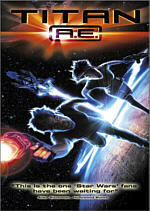 This one presents Verhoeven with actors Casper Van Dien, Dina Meyer, and Neil Patrick Harris. They all sat together for this running, screen-specific piece. If you want lots of concrete information and interpretation of Troopers, stick with the Verhoeven/Neumeier track. If you just want to have some fun, give the actors’ discussion a listen. That doesn’t mean we find no interesting data from the second commentary. It includes some useful material at times. However, the chat seems less formal and jokier. That tone can get annoying at times, mainly because the actors like to kid around and just relate what we see on screen. Verhoeven also repeats some info that appeared in the first commentary. On the other hand, they appear nicely lively and uncensored, and they provide some fun anecdotes from the set. Best of all, they’re totally happy to mock Verhoeven, who seems to relish his role as the authority figure. Each actor does an impression of Verhoeven to relate his manic attitude on the set, and it seems very amusing as well as informative. They even give him a hard time because he didn’t cast any of them in Hollow Man, Verhoeven’s follow-up to Troopers; they discuss the director’s tendency to use the same actors in multiple films, and then a deadpan Harris asks the others if they got the call for Hollow Man. Again, the actors’ commentary seems light on hard facts, but it made me laugh out loud a number of times. That’s not an easy feat, so I’d recommend it to fans of the film. Also on DVD One, we encounter an Isolated Music Score With Commentary By Composer Basil Poledouris. 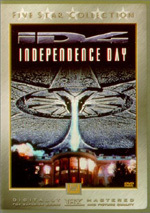 A true isolated score for the most part, Poledouris rarely speaks over the music, which appears in Dolby Digital 5.0 sound; occasionally, he starts to talk at the end of a cue, though, and also he chats on top of a few openings. When the composer offers his remarks, they’re uniformly compelling. He provides a lot of great information about his work and makes this a valuable addition to the package. I’ve rarely heard a bad commentary from a composer, and Poledouris’ effort compares favorably with my past experiences. DVD One concludes with a selection of Filmographies. Here we find basic listings for director Verhoeven, writer Neumeier, and actors Van Dien, Richards, Meyer, Harris, Muldoon and Busey. As we move to DVD Two, we encounter a new documentary called Death From Above. This piece lasts 31 minutes and 55 seconds as it combines the usual mix of film clips, shots from the set, and interviews with participants. We hear from producers Jon Davison and Alan Marshall, science fiction historian Paul Sammon, director Verhoeven, director of photography Jost Vacano, composer Basil Poledouris, editor Mark Goldblatt, creature effects creator Tom Woodruff, human visual effects creator Kevin Yagher, and actors Van Dien, Meyer, Harris, Michael Ironside, Denise Richards, and Jake Busey. Overall, “Above” offers a solid look at the movie. We learn about the origins of the project and the Robert Heinlein book and go through differences between the two. We then get information about the shoot and more info about the fascist message. These elements come across particularly well since we get to compare film scenes with old propaganda. We also observe fine material about Captain Dale Dye’s boot camp for the actors and their additional training. Some of the information repeats what we get in the commentaries, but it still provides an entertaining and useful discussion. In the Know Your Foe domain, we locate five special effects featurettes. Each of these provides a quick text overview of the different bugs and lets you access the individual featurettes; a helpful “play all” option also appears. These programs run between 63 seconds and six minutes for a total of 16 minutes and 54 seconds of footage. The pieces mix movie clips, varying stages of effects footage and pre-effects shots from the set, and interviews with participants. We hear from science fiction historian Paul Sammon, creature designer Craig Hayes, director Verhoeven, creature effects supervisor Phil Tippett, director of photography Jost Vacano, creature effects creator Alec Gillis, producer Jon Davison, human visual effects creator Kevin Yagher, and creature effects creator Tom Woodruff. Overall, this is a nice collection of material. We learn a lot about the creation of the bugs and get good info about their development. The behind the scenes material’s very interesting and adds to the presentation. “Know Your Foe” provides a solid addition to the DVD. The Starships of Starship Troopers provides a quick three minute and 25 second featurette. It includes movie clips, some good behind the scenes images, and interviews with Verhoeven, spaceship visual effects supervisor Scott E. Anderson, and Jost Vacano. The program’s far too short to offer any depth, but it still provides an entertaining glimpse at the design of the ships. In the FX Comparisons domain, we find nine different “before and after” programs. Each lasts between 12 seconds and eight minutes, 35 seconds for a total of 28 minutes and 54 seconds of video snippets. These fill most of the frame with unfinished footage; we see either raw material from the original shoot or crude effects work. An inset in the lower right-hand corner shows the final film, but you won’t care about that; you’ll be too fascinated by the incomplete material. The clips mainly offer the original production audio, which is the best part; we hear Verhoeven shout at the actors and make all sorts of bizarre sound effects. Overall, I thought these snippets were a tremendous amount of fun. Storyboard Comparisons offers a similar compilation, though it seems much less entertaining. Regular readers will know storyboards don’t much interest me, and these are no different. The art takes up most of the screen, and we again see the final film in the little inset box. The three comparisons run 110 seconds, six minutes and 50 seconds, and 150 seconds, respectively. The presentation seems good, but the material doesn’t fascinate me. The Vintage Documentary offers little more than a superficial seven minute and 55 second promo reel, the kind you'd see between movies on HBO. Along with some shots from the set, it includes quick sound bites from Verhoeven and creature visual effects supervisor Phil Tippett plus actors Richards, Van Dien, Meyer, Harris, Patrick Muldoon, Clancy Brown, Jake Busey and Michael Ironside. The behind the scenes footage provides a modicum of interesting material, but overall, this piece seems fairly useless, especially given the inclusion of the new documentary. The Conceptual Art Galleries offer stills that cover 10 topics. You can access these individually or scan right through all 135 of the images. As one might expect from the title, these all cover artwork created for the film. For example, we see drawings of costumes, sets, and other items. It’s a nice little collection, though the pictures seem too small; they should have filled more of the screen. Next we get five deleted scenes. All of these essentially present character bits that involve Denise Richards as Carmen. As character pieces in a film that lacks compelling characters, they add little to the experience, though they do flesh out some concepts, such as why Johnny’s parents aren’t citizens. However, you’ll likely find them more interesting if you watch the after listening to the Verhoeven/Neumeier audio commentary; I won't reveal why, but the reasons that these clips failed to make the cut becomes much more apparent when you hear from those two. The segments last between 45 seconds and three minutes, 50 seconds for a total of seven minutes, 49 seconds of footage. Scene Deconstructions contains two fairly interesting reels that show the progress of some effects shots and how they were integrated with real action. Narrated by Verhoeven, this area offers a fun look at the material. “Scene Development: Tanker Bug Ride” lasts four minutes and seven seconds, while “Scene Development: Rodger Young Destroyed” goes for three minutes and 27 seconds. Called Bug Test Film: Don’t Look Now, we get a brief effects test sequence that apparently was shown to crowds at sci-fi conventions in an attempt to stir up some pre-release hype. It runs 69 seconds and it’s entertaining to see. Next we get two screen tests between Van Dien and Richards. Nothing surprising here, although they actually seem a little more real and genuine during this test than at any point in the film. The first lasts 105 seconds, while the second runs 110 seconds. Most interesting to me was the fact that the combination of their acting and the camera angles - mostly close-ups - make their scenes look just like excerpts from any soap opera. Pretty faces and poorly emoted feelings - sounds like daytime TV to me! Finally, the package concludes with some theatrical trailers. This area adds the promo for Troopers as well as clips for Final Fantasy: The Spirits Within, Roughnecks: Starship Troopers Chronicles, and Resident Evil. As you’ll note from all the underlined text above, this new special edition includes a lot of new material. Does it omit anything from the original DVD? Yes - we lose the good text production notes found within its booklet. The new package uses a tri-fold digipack format that doesn’t allow for booklets. While I liked that text, I’m more than willing to take the loss since we get so much great new material. No one will mistake Starship Troopers for a great film, and it suffers from quite a few flaws. However, it provides enough interesting moments to become something moderately entertaining at times. The DVD offers good picture with excellent sound and a terrific compilation of extras. Recommendation time, and as always with reissues, I have to cover a lot of bases. If you don’t already own a copy of Starship Troopers but would like one, the SE is the way to go. I thought the picture and sound seemed identical with the old one, and it provides a lot of excellent new material. For those who already own the old DVD, the possibility of a replacement relates totally to your enjoyment of extras. If you don’t care about supplements, then pass on this one since it doesn’t improve the picture or sound quality. However, if you do like extras, then you definitely should give the SE a look. Columbia Tristar have produced a lot of semi-bogus special editions that didn’t provide much useful new material, but Starship Troopers doesn’t fall into that category. From the two new commentaries to the excellent documentary to a wealth of behind the scenes footage, this set packs a great deal of unique information. Fans should immediately chuck out their old copies and enjoy this fine new package.